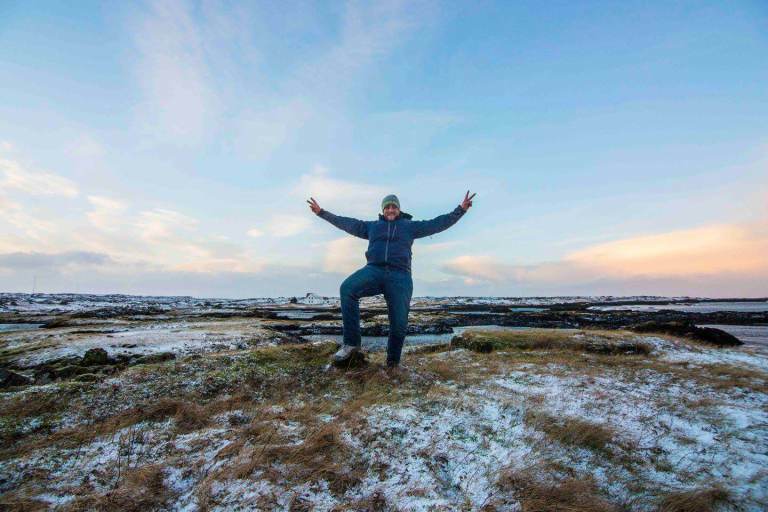 48 Hours in Iceland: Winter Edition! Iceland is unlike any country we have ever been to before, and the freedom we feel there gives us a sense of excitement we always chase when we travel. Not only does the small country only have around 300,000 residents, but during the winter months, there are far fewer tourists which only brought out the magic. Arriving at the end of December, we were met with nearly 20 hours of darkness per day, only having partial sunlight from about 11am-3pm each day. While most think Iceland is in 24 hours of darkness all winter, this period really only lasts around six weeks and the little light that does appear is absolutely stunning. For any photographers out there, the long light of the winter sun in Iceland gives you hours of golden light and on a clear day makes for spectacular sites and photographs. The other reason we embraced the dark? Our everlasting hope of finally seeing the Northern Lights, but we'll get back to that later. As far as getting to this magical island for 48 hours in Iceland, your best bet is to get to any major European hub and then jump on a cheap flight with Icelandair, who couldn't make it more simple. If you're feeling fancy, try their "Saga Class" offering Icelandic hospitality and specialties with a smile. After landing around 4 pm, in pitch black, we hopped in our trusty SUV from Blue Car Rental and were on our way. We had such an amazing experience with them last summer that we requested the exact same car complete with the onboard wifi, a complete life saver. We even got some extra tips of the best unknown areas to explore, which was much appreciated. Our tip for accommodation is to look up Airbnb in Iceland and chances are you'll find whatever you need. With the huge influx if tourists in Iceland the last couple years, the hotel industry just cannot keep up. The result is far fewer hotels than you'd expect, at prices which might make you wince. We found a cute little family home 5 minutes outside of town which was perfect for our stay and extremely reasonably priced for 48 hours in Iceland. It goes without saying, but we'll say it again. Renting a car in Iceland truly gives you the freedom that you want in such a wild and open country. Our number one tip for visiting is always "just drive and try to get lost". The most incredible memories you'll make will be accidental things you find along your way just driving like waterfalls, valleys, mountain peaks and endless winding roads. Our most common comment before we left was "you're insane, you're going to freeze to death", and I don't blame people for thinking that. After all, it is called ICEland for a reason. However, the cold wasn't too bad in December, hovering around 0-5 celsius. The wind, however, is a different story. Thank God for Icewear, who take pride in providing modern Viking armor for both tourists and Icelandic people alike. When we travel to a foreign country we always try and eat where the locals eat, so it only makes sense to wear what the locals wear also - and everyone in Iceland wears Icewear. If you've watched our summer Iceland road trip video, you'll know we went mostly north from Reykjavik and explored the Sneafflesness peninsula mostly, with stops in Olafsvik, the shark museum and famour Kirkjufell. This time, however, we were determined to go inland more as well as discover the South Coast of Iceland, which we had heard so much about. If we were only spending 48 hours in Iceland, the south coast was on our list. Heading inland first, we drove through the stunning Thingvellir National Park, one of the few UNESCO World Heritage Sites in Iceland. Thingvellir is extremely unique, in that it is literally split in half by the meeting of the North American and Eurasian tectonic plates, something you'd never know just by driving through. When we heard Arctic Adventures offered winter Arctic snorkeling between the tectonic plates, we couldn't resist. Anne took some convincing, and even though the water was only 2 degrees, the air outside was -10 so we were much warmer in the water than out. This is by far the coolest thing I've ever done that I never knew existed. 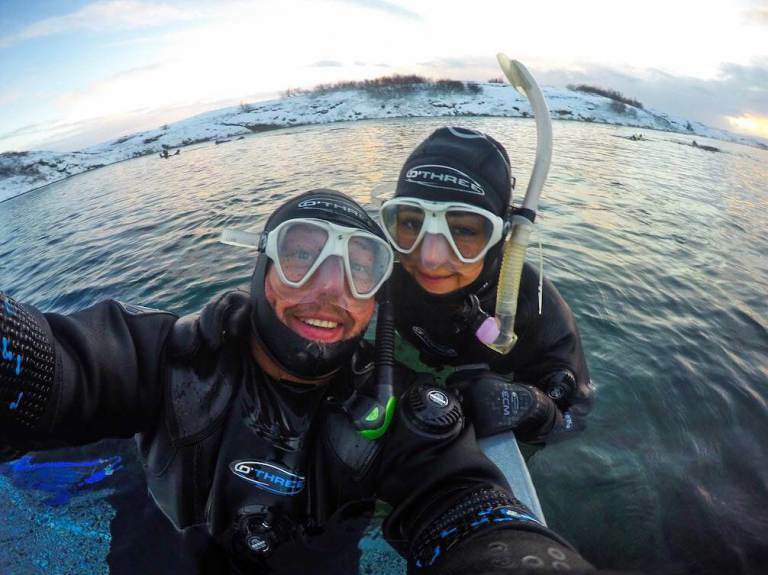 Snorkeling in the Arctic in the middle of the winter is not something I had ever thought of doing, but if you go to Iceland and opt out of this adventure, you're really missing out. Thingvellir is also home to the amazing geyser and Gullfoss waterfall, but incredible sites well worth the journey inland. As we've said so many times, just get lost. Drive in one direction and don't stop until you see something you have to pull over for. I promise it will happen about every five minutes. After a long day spent in Thingvellir, and having the clouds disappear and sun finally come out, we knew this would be our best, and only, chance to see the Northern Lights. To see the lights, you obviously need three things to align. First, it obviously must be dark enough. In the middle of winter, we had this sorted. Yes, the lights happen all summer too, it's just too darn bright to see them. Second, it must be clear. This was by far our biggest challenge, especially on such a short trip, but we had to try. And third, they must be active. There are many Aurora tracking apps you can download, which I obsessively updated every ten minutes hoping we'd get lucky. The Northern Lights strength is measured on a scale of 1-10, with four being the weakest they can be to truly experience them in the night sky. After driving to the middle of nowhere, we parked and just waited. After a few minutes, we got out of the car, looked up and could just start to make out the faint markings of colors in the sky. Starting off, they just looked like wispy clouds, but after a few minutes, the sky erupted into a stunning mix of yellow, green and even some reds and purples. We sat in complete awe, laying in the snow and staring at one of mother nature's most magical displays shocked we were lucky enough to see them having only spent 48 hours in Iceland. Dancing across the sky we did out best to take photos to share the experience, but nothing will ever come close to how they looked in real life. This night they were only at a four - I cannot imagine the beauty of seeing anything stronger. Early the next morning we woke up to head on the South Coast Adventure with Gateway to Iceland. After seeing where we traveled to last June, our friends at Golden Tours told us we absolutely had to check out the south coast, and we are so happy we did. While we recommend driving a lot in Iceland, it was really nice to jump in the tour bus, a small one with only about 15 people, and head out all day. We were gone all day, from around 7am-7pm, so it was a relief not to have to do all the driving. The South Coast is well known for HUGE gusts of wind, some which even blow smaller cars completely off the road, so take precautions when heading that direction. We first stopped at Skogafoss, one of the Iceland's famous waterfalls, of which there are many. Absolutely stunning and covered in ice, we walked as close as we could to the sounds of pounding Arctic water. Thick layers of ice covered everything from the waterfall itself, to the mountain walls and the ground all around us. If you really want to explore these areas, bring crampons, they will be a huge help. 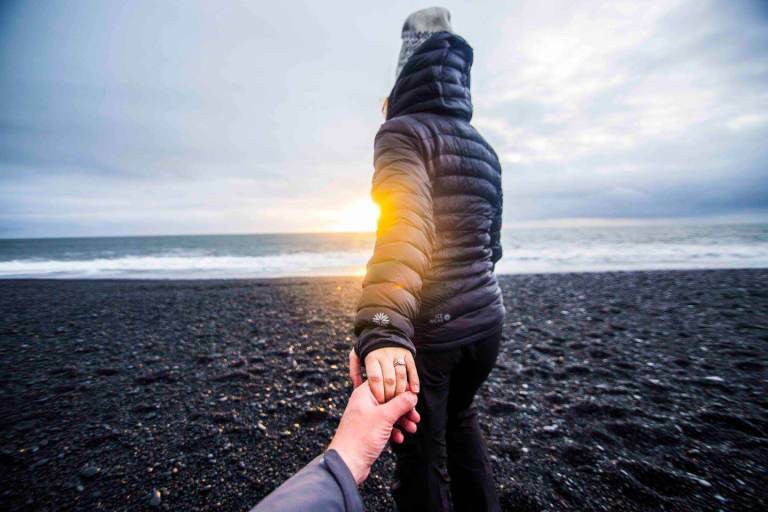 Next, we headed to the famous Black Sand Beach (Reynisfjara), one of the most iconic sites in Iceland. While feeling like we were back 500 years in history and in Game of Thrones, it is impossible to not think of the awesome natural beauty and stunning power of the rocks, volcanoes and powerful seas that make up and surround this island nation. It is almost too much to handle seeing some of the things you will experience. The sights are SO different from anything you have seen before, and it all looks fake. As the afternoon light was leaving us, we hurried on to the amazing Sólheimajökull glacier, which is sadly retreating far too fast into the vast interior. Once close enough to the road to just park your car and snap a quick photo, you now need to hike a good 20 minutes inland to find this sleeping beauty. The insane blue hues deep in the ice will simply take your breath away, and the undulating shapes of the ever changing ice are simply magical. We couldn't get enough. At the end of the day, we cannot say enough good things about Iceland. If you follow us, or are unfortunate to be one of our friends, you'll be begging us to shut up about Iceland, I know, we talk about it far too much. But if you forgot what was beautiful in the world in 2016 or simply need a reminder of the natural power and beauty of the world around you, visit Iceland. Iceland felt like therapy to us both. It felt like hitting the re-set button and recharging our batteries. It reminded us why we travel, how much there is out there still to discover and that no matter how stressed we are in our daily lives, we know there is a magical island just a few hours away that will bring us back to reality.